The Filipinos passion and enthusiasm to meet Pope Francis has been seen greatly both in real life and social media on social media. On the day of the Pope’s arrival on Thursday, large crowds of people were waiting for him at Villamor Airbase. His motorcade from the airbase to his temporary home in the country, the Apostolic Nunciature, was also lined up of devotees wanting to get a glimpse of Pope Francis. On social media, our keenness to have the Pope in the country was also felt. 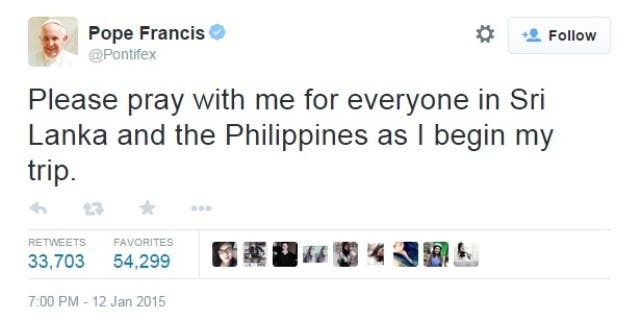 Last Friday, which marks the second day of the Pope’s five-day visit in the country, Pope Francis posted a tweet in Filipino. The said tweet obtained 52,619 retweets and 57,533 favorites as of 11 AM, Sunday. This is said to be the pope’s most popular tweet to date. His second most popular was on Easter 2014, while his third most popular tweet was when he became Pope. 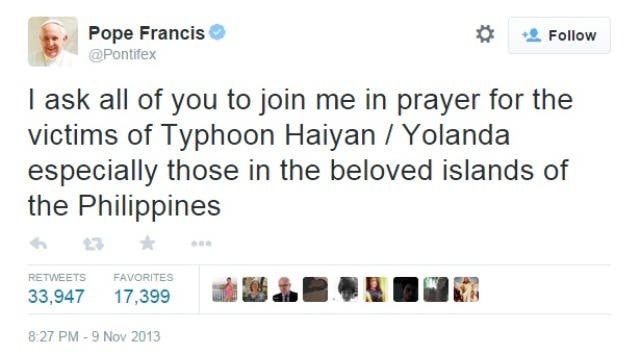 Apparently, Pope Francis’ fourth and fifth most popular tweets were also related to the Philippines. 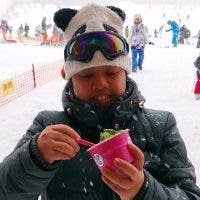 What the you think of this? Rock in Focus: Contra Tiempo by The UP Industrial Engineering Club!